The Xuron flush cutters will cut soft wire up to 12ga. Perfect for headpins, rivets and more. These cutters are made in the USA and Xuron products are made to last. They feature soft padded grips with spring loaded handles. 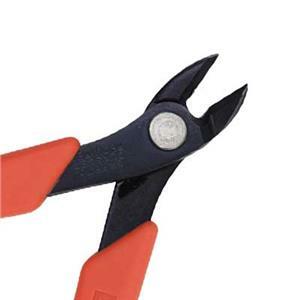 Visit our pliers and cutters section for more beading jewelry supplies. Notes: Perfect all around cutter! Shaped to fit medium to large hands. Brite orange handles make it easier to locate on your bench. I love my Xuron cutter. It is so smooth and cuts through so many things that other more ordinary cutters just can't handle. I love the bright orange handle, too, as I tend to lose my tools in a moment of creative passion! I am thinking of getting a second on so that I can have them in the different areas of my studio... one for the jewelry making table and one for the wire working station. I love my Xuron Maxi-Sheer Flush Cutter!!! It is my go-to for all projects at the bench. I’ve had them now for over a year and they still feel and work like new; that’s quality! Being new(ish) to jewelry-making when I made my purchase, I wasn’t sure which products would go the distance, but now I know, this brand makes the cut (pun intended)…! I am purchasing more and more tools as needed while crafting many new pieces; and soon I’ll be taking my work online and foresee gathering a large social media following. See you in cyberspace!